The Kamov Ka-15 (NATO reporting name Hen) was a Soviet two-seat utility helicopter with coaxial rotors which first flew on April 14, 1952 at the hands of test pilot D.K.Yefremov. State acceptance trials were completed in 1955, and the helicopter entered production the following year at aircraft factory No.99 in Ulan-Ude. It was a precursor to the Ka-18, fitted with the M-14 engine (helicopter version). It was primarily used for bush patrol, agricultural purposes and fishery control. Ka-15 : Two-seat light utility helicopter for the Soviet Navy. 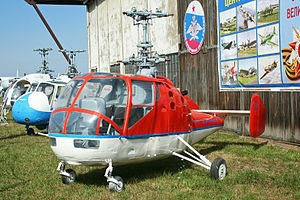 Ka-15M : Two-seat light utility helicopter. Civilian version of the Ka-15. Ka-18 : Four-seat light utility helicopter. ^ "WORLD HELICOPTER MARKET 1967 pg. 65". flight. Retrieved 21 October 2014. ^ "Military Helicopter Market 1971 pg. 581". flight. Retrieved 21 October 2014. ^ Stroud 1968, pp. 136–138. This page was last edited on 19 June 2017, at 13:09 (UTC).